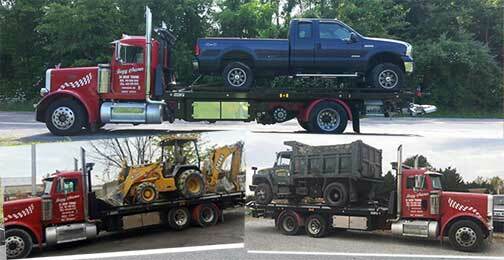 24 hr heavy duty towing, car towing services, heavy truck towing and heavy equipment hauling in Carroll County and Baltimore County, Md and long distance to Pa, Va and Oh. Buzzy Shamer Towing provides heavy rollback towing for vehicles, equipment and cargo in Carroll County, MD and long distance. With the largest tractor trailer with flatbed in the area we can haul anything. Call us for immediate or scheduled hauling - sea containers, concrete, farm and construction equipment etc. We have extensive training and knowledge in underwater vehicle recovery. We are licensed to safely remove your car, truck or boat from water. These operations can be dangerous if not directed correctly, call Buzzy Shamer Towing at (443) 375-8101 now. Buzzy Shamer Used Car Parts Yard, Finksburg, MD Visit our 3 acre salvage yard to find used auto parts in Carroll County, Md. We have been collecting parts since 1977.